Christmas is around the corner and the Low Carbon Network thought it would be great to have one last get-together this year so we're organising our very own Low Carbon Christmas party! There'll be a range of hands-on workshops to choose from - so get stuck into making Up-Cycled Presents with Buffie Mawhinney from Funk up my junk, creating Recycled Gift Baskets for refugee kids with Grey Lynn 2030 & Earth Action Trust or join the Love Food Hate Waste - Community to learn about Cooking With Leftovers. 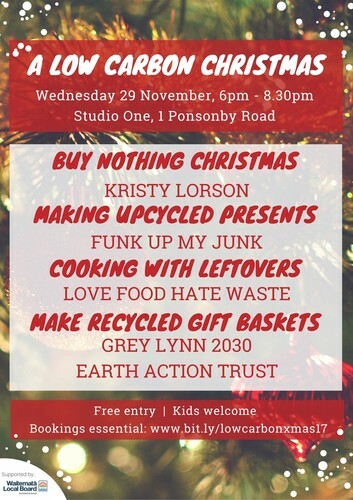 We will also have Auckland's very own Zero Waste Warrior blogger Kristy Lorson come and talk to us about every retailer's worst nightmare - the idea behind Buy Nothing Christmas. This will be a fun, free and for the family event, so lock in the date, invite some friends and we'll see you there! Bookings essential, visit bit.ly/lowcarbonxmas17.